Leading the way for the ruin pub culture in Budapest is Szimpla Kert, a district VII gem found on Kazinczy Utca (street). The pioneer of ruin pubs, Szimpla provides tourists and locals an eclectic atmosphere, with art, culture, vintage findings and my architectural favorite, exposed brick work. While I have yet to venture to any ruin pub at night (surprising I know), we rode our bikes to District VII today to explore the farmers market. I had read online that last week marked the start of the Farmers market season so we embarked on our bikes today to check it out. To put it in perspective, it is about a 10 minute slow cycle for us so not too far. When you first hit Kazinczy Utca, you get a nostalgic feel. The buildings look weathered, the streets are worn but the neighborhood and area is very much alive. There is an open air lot which has all your favorite food stalls. 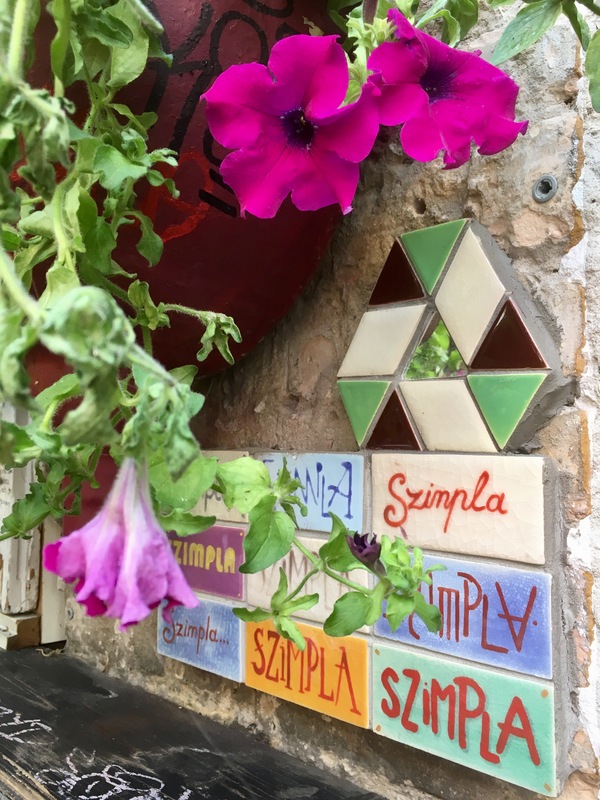 Small cafes are jammed with coffee addicts and all of the sudden you stumble upon Szimpla, a hip ruin pub that has opened its off-the-wall doors to tourists and locals looking to sample some of the local farmers’ specialities. Items such as fresh cheese, jams and spices, fruits and veggies and some authentic folk music are available for purchase. We enjoyed every inch of the pub looking at all the decor, snapping photos, exploring each nook and corner, and people watching. We also explored their shop which has some amazing finds such as handmade items, collectibles, artwork, souvenirs and more. Szimpla kert is very much a happening spot and a place to not miss! I can only imagine how exciting it must be at night as well. Also, for those interested, ruin pubs are a big culture here in Budapest. It is a tourist trap for sure but very much embedded in the locals as well. Here is a link I found that shows several of the ruin bars available. I have not utilized this company for their tours but found the information handy. If you are ever in Budapest and want some night life or culture, check this area out. You will not be disappointed, even if you are not the party-going type like me. They are great places to socialize and enjoy the area’s talented artists, farmers, musicians and more. Hope you enjoyed the post.